The Chase Sapphire Preferred Card and Sapphire Reserve are favorites of many award travel enthusiasts. The Sapphire Preferred has been popular for some time by offering double points on all travel and dining purchases, while the new Sapphire Reserve Card ups the ante by offering a 100,000-point sign-up bonus (after spending $4,000 in three months), 3x points on travel and dining, a $300 annual travel credit and Priority Pass Select membership. 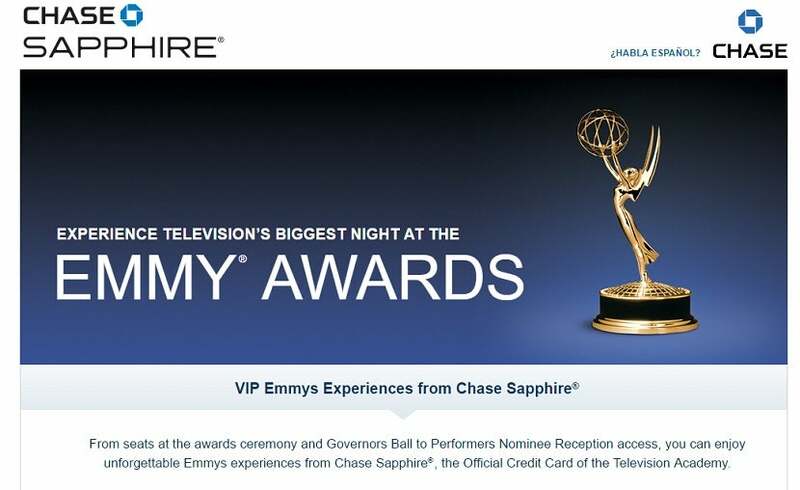 While most cardholders are familiar with the numerous travel benefits of the Ultimate Rewards program, what they might not know is that Sapphire cardholders receive exclusive access to special events throughout the year, including the 2016 Primetime Emmy Awards, as Chase Sapphire is currently the official credit card sponsor of the Television Academy. 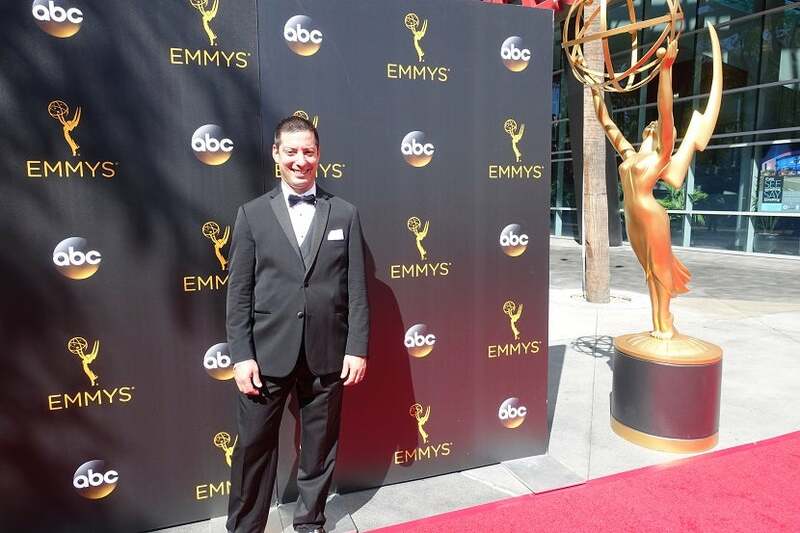 Last night, TPG and I were granted access to the Emmy Awards ceremony in Los Angeles. as well as the festivities before and after the show. Chase Sapphire is the official sponsor of the Television Academy. TPG and I were invited to attend on behalf of Chase to experience the entire event, including the Red Carpet Welcome Walk, orchestra seats to the awards show and the post-show Governors Ball. 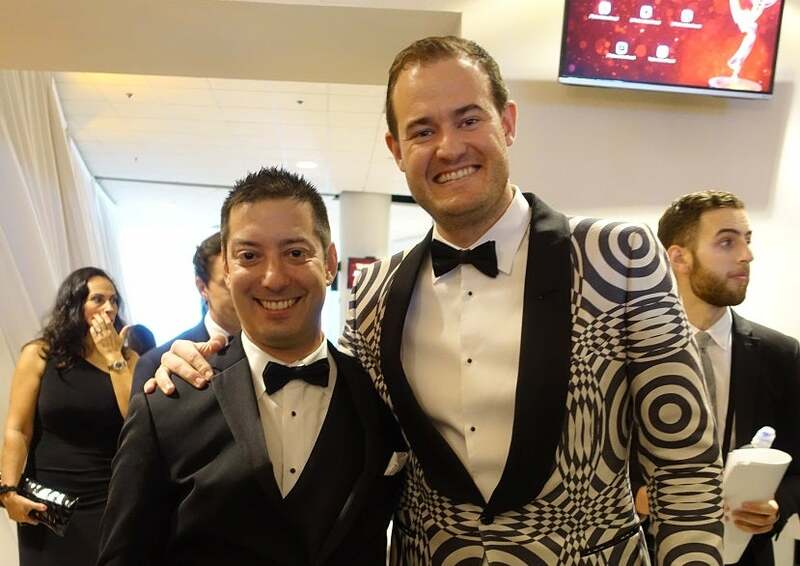 Let’s just say that TPG’s tux was a tad bit more distinctive than mine! The day began at 2:45pm with the Welcome Walk Pre-Reception in the lobby of the Staples Center, where cardmembers could see and be seen with nominees and presenters, and enjoy beverages and appetizers prior to attending the walk on the red carpet. You know that feeling you get when you see a person who looks a lot like a celebrity? In this room, you got that feeling very often, and it almost always turned out to be the television star that you were thinking of. I managed to get a photo as well. I had my picture taken by the entrance to the red carpet. Outside, cardholders got to see the Emmy Award nominees and presenters up close as they arrived on the red carpet, posed for photographs and conducted interviews with the entertainment press. You just never know who will walk right past you on the red carpet. Since it was a little on the hot side that afternoon, it wasn’t the most comfortable experience for me in my tuxedo, but it was nevertheless a thrill. There were no shortage of television stars on the red carpet. 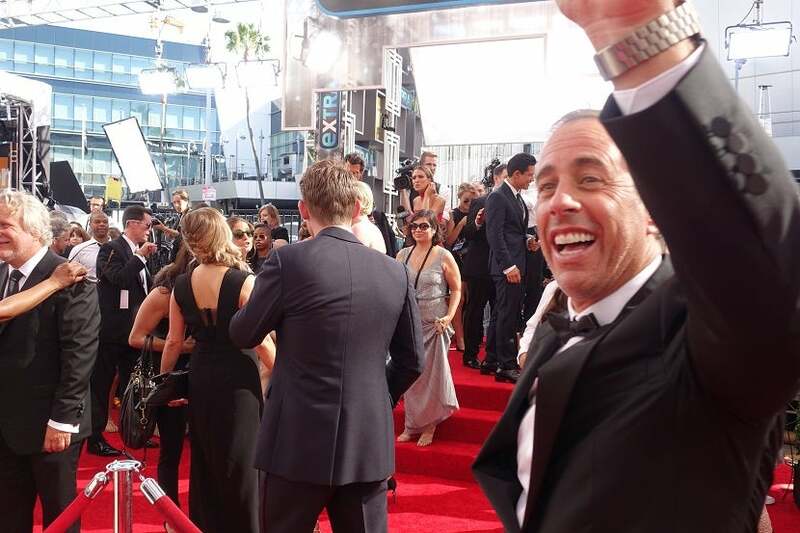 The Emmy Awards themselves are much more entertaining in person than they are on television, as the entire crowd gets to enjoy the shared experience of seeing favorite television stars being selected to win, and feeling the emotion of the winner’s speech. 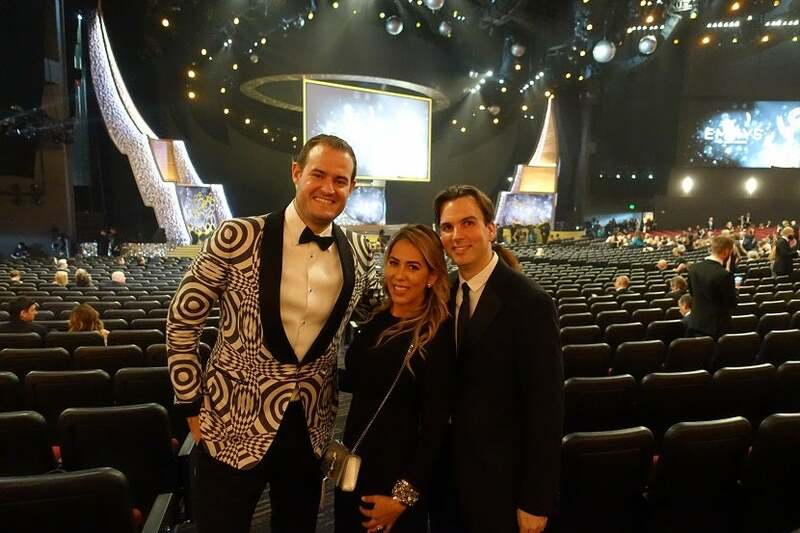 We sat with Ryan Akly and Raquel Souza of Atlanta, who are TPG readers who got to attend because they are Sapphire cardholders. For me the, one of the highlights was Julia Louis-Dreyfus’s speech where she thanked her father who had just passed away days before. In addition, Aziz Ansari (Masters of None), gave a poignant tribute to his parents when he won his second Emmy after he was unable to do so when his mic was cut off earlier in the evening, something that viewers at home might have missed. Another fun moment was when host Jimmy Kimmel had peanut butter and jelly sandwiches distributed to the audience, courtesy of his mother. 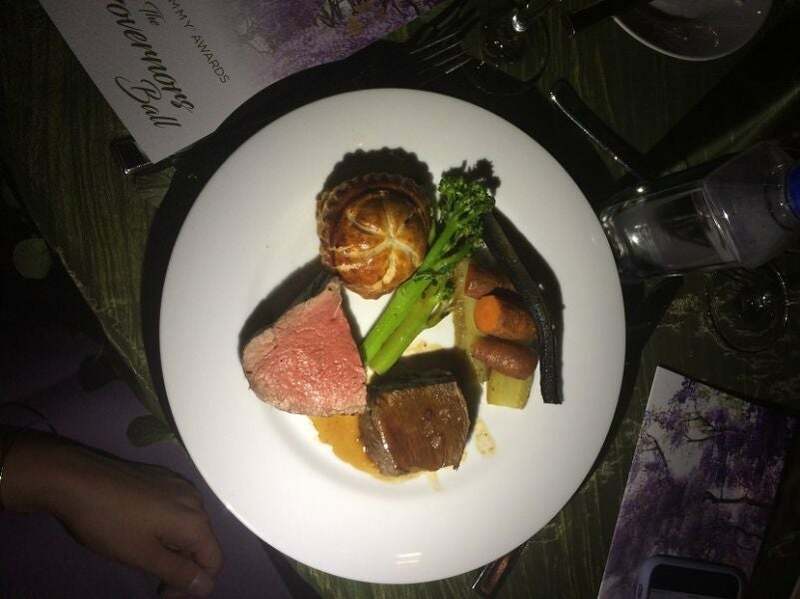 The main course featured two different cuts of beef. Immediately following the awards show, we were invited to attend the Governors Ball, which included dinner, drinks, dessert and entertainment. The menu was stunning, including both thyme-roasted tenderloin and slow-braised short rib and a desert of tropical coconut mousse, torched meringue and exotic fruit. Without taking anything away from the dinner, the best part of the ball was the chance to mix and mingle with nominees, winners and presenters. In fact, each of the 600 or so tables came with a directory of which celebrities were seated at which tables, making it relatively easy for me to find my favorite television stars. Mustering the courage to say hello was a bit more difficult. My commemorative invitation to the Emmys. As part of this package, guests received a professional photo next to the life-sized Emmy statue prior to entering the Welcome Walk, along with an Official Emmy Awards program. I also received ceremonial invitation and even complimentary parking (although I ended up just taking Uber to the events). 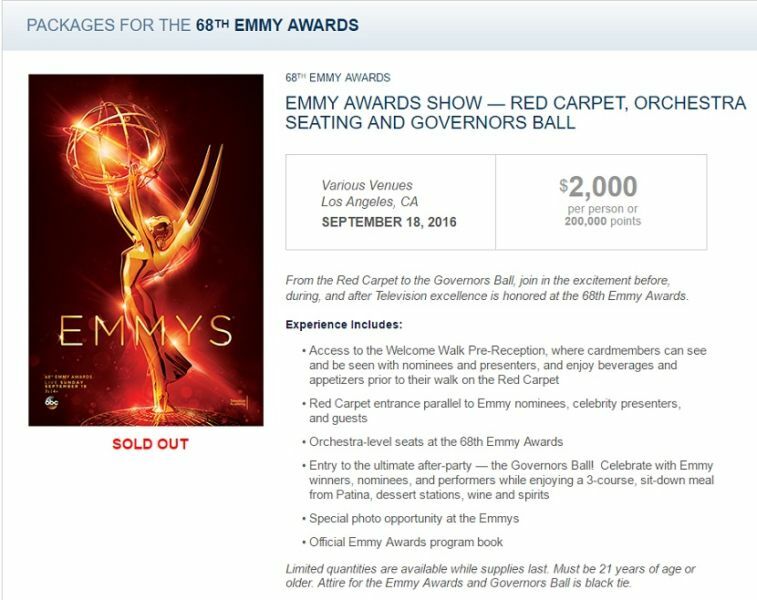 TPG and I attended this package including the Red Carpet, Orchestra level seats and the Governors Ball. 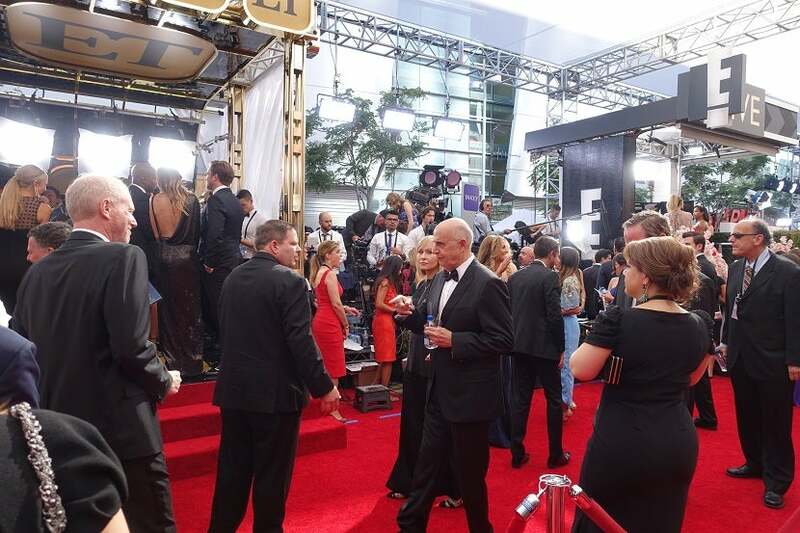 Emmy Awards Show with Mezzanine Seating: $450 or 45,000 points per person. This option included seats in the mezzanine (aka, the upper balcony) as well as an official Emmy Awards program book. Performer’s Nominee Reception (September 16th): $800 or 80,000 points per person. Included entry to the star-studded cocktail reception, plus hors d’oeuvres and dinner. 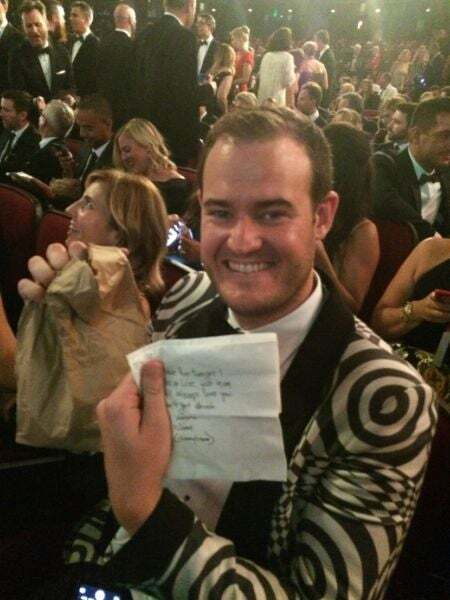 Emmy Awards Show including Red Carpet, Orchestra Seating and Governors Ball: $2,000 or 200,000 points per person. 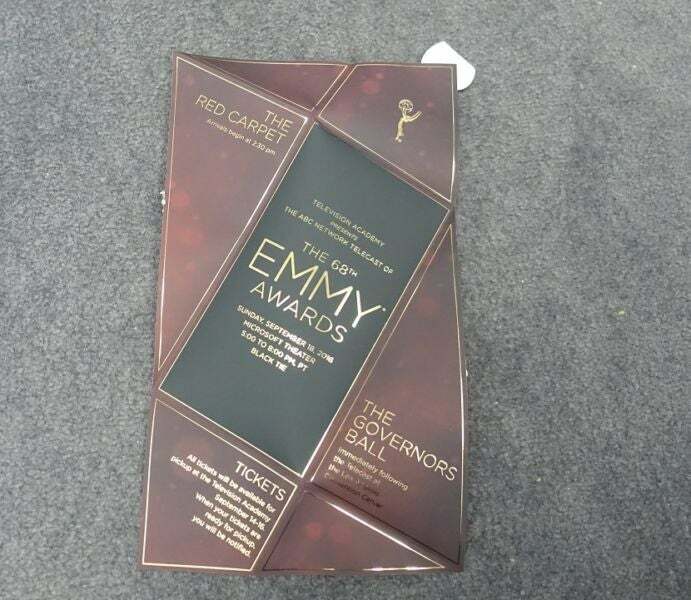 This package included access to the Welcome Walk Pre-Reception, orchestra-level seats and dinner at the the Governors Ball with Emmy winners, nominees and performers as well as an official Emmy Awards program book. Ultimate Weekend Experience (September 16-18): $3,000 or 300,000 points per person. 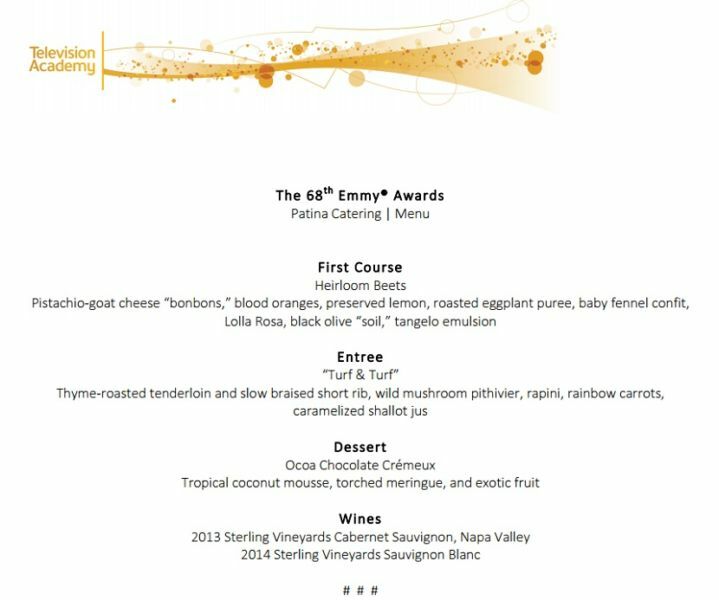 Included special access to the Emmy Awards rehearsal, the Performers Nominee Reception with dinner, the Welcome Walk Pre-Reception, orchestra-level seats, a ticket the Governors Ball and an Official Emmy Awards program book. In each case, Sapphire cardholders have the choice between using their Ultimate Rewards points or cash to book these events, however you only receive one cent in value per point redeemed. Therefore, it’s better to use cash, since Chase Ultimate Rewards points are worth 2.1 cents each according to TPG’s latest monthly valuations. While TPG’s certainly at home at red carpet events events like Cannes and the Sundance Film Festival, I viewed this as a once-in-a-lifetime opportunity to put on a tuxedo and mingle with television’s biggest stars, and I wasn’t disappointed. Our experience shows that having a great travel rewards card is not just about the points and miles; it’s also about receiving this kind of special access to extraordinary experiences.